I thought I’d list the mods I’ve used that I found quite nice. As always, make sure to backup your game before installing or using any of these.. just to be on the safe side. Some of them add content to the game and some of them are fairly simple overrides. Hopefully you’ll enjoy them as I did. I know some people bemoan the use of addons and mods, but meh, it’s a single player game, do what you will and make of your game time what you’d like. :D Another quick note, back up your game before installing any of these! Edit: I’ve tested importing my mage into Awakenings, who had been modded with all of these save the Leliana set, and I’ve only had some slight weirdness with items modded with Winter Forge. I didn’t bring in any created items, but the existing gear I changed with Winter Forge appears to have forgotten what material it’s supposed to made of. It wasn’t a huge issue for me, but there you have it. Your mileage, as always, may vary however. Leliana Item Set – This addon adds a set of armor and weaponry to Bodhan’s camp store. It’s restricted to Human Females so keep that in mind before you download it. I used this particular set on Leliana and my own Human Rogue. Again, it was more a vanity thing for me as I found the armor quite appealing in it’s look. 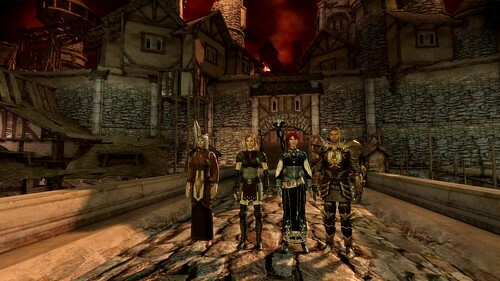 Character Respecialization – This mod allows you to respec your character as well as those in your party in Origins. Totally worth it if you may have regretted some spell or specialization choices you made early on. Winterforge – This addon is very complex and really should only be used if you want the ability to micomanage the look and stats of your gear and weapons. This mod gives you ability to refashion and modify exisiting armor & weaponry as well as create new items from scratch. It’s quite an amazing mod. The creator added a whole new crafting skill to the game as well a quest to go along with it. You can choose to use it or override that to get immediate full access to the abilities it has. I used it almost entirely to refashion gear. 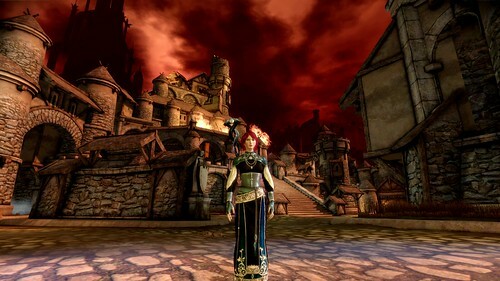 For example, Wynne was wearing Tevinter Robes which, well, didn’t suit her in my opinion. I really wanted her in traditional mage robes, so using Winter Forge I was able to transfer the stats of the Tevinter Robes into a dark colored robe for her. I even took her Libertarian’s Cowl and changed it’s model as well as the color of the fabric to match her robe. Another thing I did was to take Alistair’s boring templar looking Bergen’s Honor helm and threw those stats into a Juggernaut looking helm which matched his armor. I also changed the color of his shield so he would match also. Overall, amazing mod for those who really want a way to get your gear looking exactly as you want it to. Last weekend I spent almost the entire weekend angry and frustrated at not being able to build a prim skirt. I yelled, a lot. It’s amazing how even after more than a year in SL, I’m still a complete noob. I tried hand aligning prims… zomgwtfbbq. That lasted all of two and half seconds. Then I tried the loop rez script… which was alright, but it took far too much trial and error and I still wasn’t getting the shape I wanted. Not to mention the mind boggling task of retexturing skirts into different colors would probably make me pull all of my prim hair out. So I googled.. and came across some posts about Vint’s Primskirt Builder and wow, it’s the best thing ever. It’s so user friendly and someone like myself was able to make a skirt in just a few seconds and multiple skirts in a few minutes! <3 I have a tendency to break all that is technology, so the fact that this worked and I didn’t screw it up immediately is huge.